The Great Lengths single strand fusion method uses keratin, which is the tough protein substance that is the main structural component of our hair and nails. The Great Lengths keratin bond is a polymer compound whose molecular structure is very similar to that of human hair so it moves and behaves like your own hair to ensure a gentle, yet strong hold. The end of the pre-tipped strand is softened by the applicator tong so it can be molded to your natural hair. This method is high maintenance and needs to be cared for every day to ensure that there is no damage to your natural strands. On average, the extensions will need to be removed and reapplied every 12 to 16 weeks. 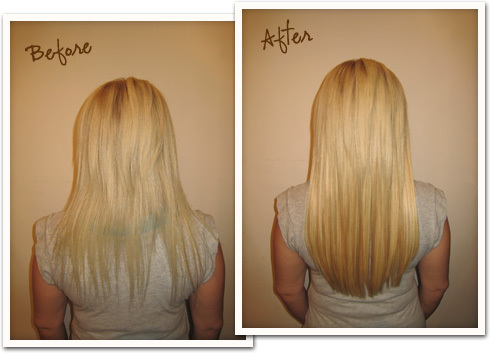 To learn more about hair extensions or to book your consultation, visit our hair extensions FAQ.